It takes just 30 minutes for Kolako to walk from his home in Guinea to the small Liberian border village of Vonema for work. The man, who appears to be in his forties, wears work clothes and carries a small machete at his side as he makes the cross-border journey through the Forest Region to Vonema — a trip that takes less time than traveling to the nearest Guinean village. As he emerges from an unassuming tree-covered path, Kolako is directed to a wood bench staffed with young men and an immigration officer whose military-style fatigues stand out in this farming village of 1,500 mostly Mandingo and Loma people. The village doesn't have access to running — let alone clean — water. But men at the table are equipped with a temperature-taking gun and a notebook to record Kolako's entry from one of the three paths that connect Vonema to Guinea. These paths carry up to 20 Guinean visitors a day into the village in Liberia's Lofa County, entrances that were by not official entry points before the Ebola virus spread to the border region more than a year ago. Even now, no passports are stamped and no tourist entry cards are filled out. Related: Liberia's Ebola widows face grim future as world's deadliest outbreak subsides. Before Ebola, Kolako made the cross-border trek to Vonema almost daily. But Liberia closed this crossing in July, along with many others along the country's long, porous borders in an effort to curb the spread of Ebola. When Liberian officials lifted the State of Emergency and reopened the borders on March 2, Kolako resumed his trips. The extreme measures worked: The borders opened in March just as new transmissions of the virus in Liberia hovered near zero. From March 5 to March 20, the country enjoyed a three week period without any confirmed cases. (The streak ended when a new infection was diagnosed in the country's capital). Vonema is just one of the nearly 40 official border crossings, countless unofficial entry points, and upwards of 300 towns on or near Liberia's borders with Sierra Leone and Guinea, and border crossing control is seen as essential in order to prevent the disease from spreading to Liberia as the country's neighbors continue to see infections. The fluidity of travel between the three countries — as well as the cross-border span of families and ethnic groups — has made collaboration between the Liberian government, community leaders, and NGOs an integral part of the ramping-up of border surveillance measures. Maryland-based non-profit Global Communities is one of the many organizations heavily involved in efforts to prevent Ebola's spread, providing logistical and hands-on support to key players in the outbreak control activities. The organization's Director of Humanitarian Assistance, Pia Wanek, told VICE News that her group was relieved to see Ebola rates rapidly declining in Liberia, but stressed that a multi-country perspective was crucial. "Cross-border Ebola infection is a clear and present danger," Wanek said. "To counter this we have to work both within official border crossing structures and also unofficial — especially working at the community level." With more than a decade of experience working in Liberia, Global Communities provided hygiene kits along with burial and environmental health team support. They also engaged with important players at the community level to ensure protocols were implemented. Now the group is adding border support to its tasks, ensuring the ThermoFlash thermometers are available, and working with leaders to build out risk monitoring systems for their villages. She said maintaining triage and emergency response systems at the borders is also key. 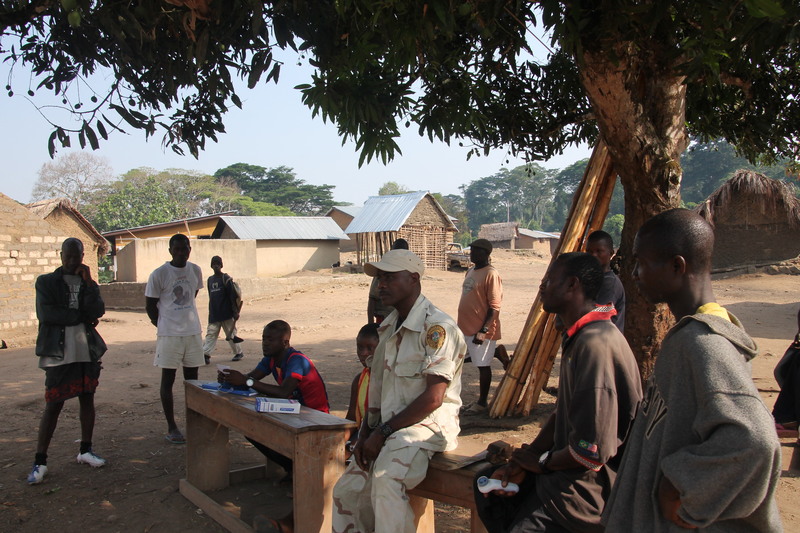 Villages like Vonema, for example, are required to post volunteers at the makeshift entry point to register every entrant from Guinea. They have to take their temperature, while also gathering information about where they are coming from and where they are going. Vonema's community coordinator, Anthony Disisay, said at times the process can be challenging. Travelers are still getting used to the new measures. "Each time they come here, I talk to them nicely, after a few minutes the person [points the thermoflash at] them to get the temperature," he told VICE News, explaining that the weapon-like appearance of the temperature gun can be confusing. In other cases, he said people will protest, saying they were already checked in Guinea. But according to Disisay, it's important that they remain vigilant. Organizations like Global Communities may be delivering the thermometers and the government may be posting immigration officials in the villages, but Brett Sedgewick, a technical advisor for the NGO, stressed that this is just the formalization of effective practices many communities developed and put in place on their own during the outbreak. "This is a formal process kind of built out of protocols communities were developing," Sedgewick told VICE News. "Lots of villages were setting up quarantines outside of the community… it didn't even matter if you had a temperature." Vonema was one of the many villages in Lofa County that successfully implemented its own protocol measures tailored to community needs, and managed to prevent the spread of a virus to their village that ravaged nearby towns and related communities just across the border. The town chief, LJ Kamara, a member of the Loma ethnic group, took fast action once he realized the severity of the outbreak. Word of a deadly virus known as Ebola surfaced in the village as early as March when it first crossed into Lofa County. Initially, Vonema was one of the many communities where villagers barred county health and awareness teams from entering its grounds, for fear they were bringing the virus or simply due to disbelief. But as news spread that the virus was killing villagers in the nearby town of Barkedu, now considered one of the hardest hit areas during the outbreak, Kamara began to recognize the severity of the situation. "We were here when we received the message from Barkedu that the Ebola is outbreak in Barkedu, so everybody was concerned," he said, wearing an Atlanta Braves baseball cap while perched on a hill overlooking his small village. Soon after, he attended a meeting about the outbreak in the county capital of Voinjama, where he was instructed on guidelines for preventing the virus. After learning more about the specifics of Ebola, the chief returned home that August day knowing drastic action was needed. "That day was not an easy day. When I came [back] to the gate there, I told them no one should go in, no one should go out. [Stay] down where you are," he recounted. "People were running away from Voinjama [at that time]… so we put our gate here." Initially, he faced opposition even from his own people, who accused him of trying to make money. Luckily, Deputy Chief Mamadee Kamara, despite being from a rival ethnic group, trusted the information he brought back from Voinjama that day. The two leaders worked tirelessly to get the message out, while maintaining steadfast in shutting their village off to outsiders. "I trust the man," Kamara explained. "We tell them we are a community." From that day until nearly November, no one was allowed to enter the town, whether they were coming from Guinea or elsewhere in Liberia. Guards at the gate were directed to turn everyone away, regardless of whether they showed signs or symptoms of the hemorrhagic fever. "People were angry," he said, telling stories of people trying to force their way in. "It hurt them, but that is how it [is] supposed to be, because if you don't do that, you don't know the state of that person coming. I didn't have a tester. I couldn't allow the people." Sometimes this meant shutting out family members, often angering those attempting to enter, with the leaders themselves having to go to the gate at times to explain. "My people they come here, they say go back," Kamara said. "My own people they come, they tried, [but] we say go back." With strict measures underway, Vonema waited out the spread of Ebola without experiencing a single transmission. Meanwhile people were dying throughout the county, and in a village across the border in Guinea that resisted control and awareness efforts. "Forty-eight persons died in that town just near. We have family from there," Kamara said. "We [didn't] accept nobody. God has been on our side up to today. No one got Ebola here." But keeping out Ebola was not without cost for Vonema. Villagers were forced to stay home during the self-inflicted quarantine, unable to travel to their coffee and cocoa farms for work. Food was scarce at the time, although NGOs brought bags of rice. Now, however, those deliveries have stopped, while the financial hit makes it challenging to purchase food. Even something as simple as drinking water is seen as a luxury. A small pond with mosquitos buzzing located at the bottom of a steep hill is the only source of water, meaning the UNICEF hand-washing buckets hanging from mud houses that are crucial for keeping Ebola at bay are often running low. Despite these hardships, Vonema remains committed to keeping tight control over its borders — even though that requires holding up the dozens of visitors on market days who are crucial to their local economy. It was almost a year ago that the first case slipped through the borders from Guinea, unleashing a virus that infected nearly 10,000 people in Liberia alone. With dozens of cases still reported each week in Guinea and Sierra Leone, the village elders in Vonema all recognize the importance of remaining vigilant, regardless of hardships. Heading up the border coordination efforts, Disisay still ensures that the post is monitored during the day and night — equipped with flashlights for late hours. They are forced to pay the volunteers in food, but he said protocols will remain in place. As long as that is the case, he said he was confident the village will stay safe. "We don't want any Ebola outbreak to enter here," he stated firmly. The Liberian government, for its part, has shifted its strategy in an effort to keep Ebola outside the country. Measures include continued surveillance for new cases, maintained isolation and triage measures, expanded testing of both dead bodies and suspected cases, infection prevention efforts, and coordinated cross border monitoring. Related: Ebola's youngest victims: Liberian children face new health challenges as outbreak subsides.